The following blog is the fourth in a series of eight examining Current Trends in the Opto-micro-electronic and RF Packaging Eco-systems giving readers a glimpse of our shared technological future, as well as hints regarding Palomar’s product development roadmap. 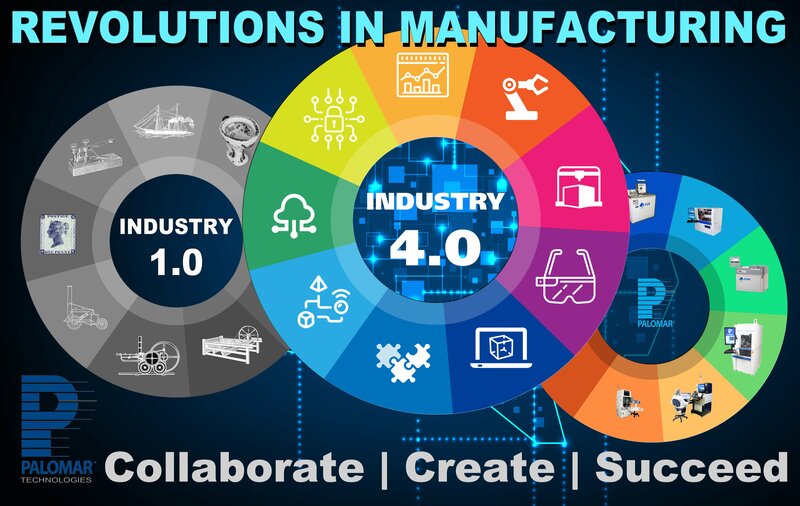 This one deals with the rapid advances in manufacturing technologies associated with what is being termed “Industry 4.0”. The views represented are entirely those of Dr. Anthony O’Sullivan Palomar Technologies Strategic Research Specialist. Dr O’Sullivan will gladly field questions and comments. #4 Rapidly Changing Manufacturing Protocols. Almost 300 years ago, in Ironbridge, Great Britain, the Industrial Revolution began. Historians argue over causes, but what matters is the fact of it. Machines replaced human labor, though “rapidly replaced” would be a more accurate narrative. One reason it is termed a “revolution” is because it happened so fast, and, of course, because it produced so many profound changes. In less than a generation, factories were built all over middle and northern England. A “green and pleasant land” gave way to towering, darkening smoke stacks. Yet such language belies a failure to understand that the era was as much about agrarian innovation as manufacturing. Indeed, had not England seen such a big rise in farm productivity labour could not have been freed to work in the new factories. Neither was it just one revolution, rather it was a succession. Thus no sooner had an extensive canal system been completed (to transport coal, iron ore and other raw materials cross country) than it was then speedily made redundant (and promptly bankrupted) by the invention of the steam railway. Trains were much faster, more nimble and could go almost anywhere. Clearly, very few saw this particular, and very disruptive technology, coming. With it came even more changes, the telegraph, the steam ship—and soon undersea cables—and the General Post Office. In May 1840, for the first time, it was possible to send a letter to anyone anywhere in the British Isles for a penny. Within in a few years that “anywhere” spread to the entire British Empire. Join these particular dots together and we create the most extraordinary story of a supply chain revolution. Manufacturers in northern England could send precise written orders to their suppliers in northern India or Mauritius ordering raw materials, and on the return, steam-powered voyages send finished goods. What the modern reader will fail to appreciate is the miracle represented both by quick effective communication and a defined timetable. Trains, ships, factories, workers, were all embraced by them. This gave the Victorians not only an extraordinary sense that they were in control of their own destinies, but a benchmark by which they could anticipate an indefatigable sense of constant and continual improvement. In every sense of the word, goods and services were to be getting better and better, and—this the key point of my blog—where getting better because the development and manufacturing processes behind them were constantly innovating and improving, often times radically. There was little room for that smothering phrase “it’s always been done like this” to gain any traction. Not so much because so many of the changes were new but because the Victorians did not think so negatively. It is very hard for the modern reader to appreciate how quickly Darwin’s Theory of Evolution was received as an optimistic truth with universal application, not just a scientific explanation of speciation. Everything was getting better. For this reason, the nineteenth century reflected—among other things—an unbounded and energetic race to invent, innovate, manufacture and produce, from the ground up. The 1851 “Great Exhibition of the Works of Industry of All Nations” showcased the technological winners. In a period of four months it was visited by 6 million visitors. Semicon China 2018 is one of its many descendants!